Loose, light, and breezy, we designed our linen Tunic with Gathered Shoulders for the dog days of summer. And with just four easy-to-cut rectangles and a handful of straight seams, you’ll be done sewing in time to enjoy these days! 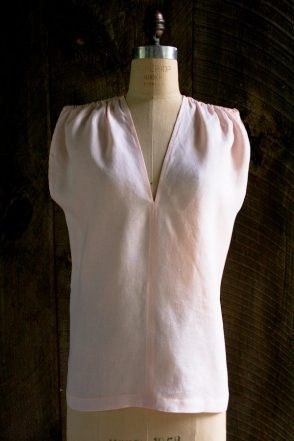 We sewed a new version of this Tunic in Watercolor Linen! 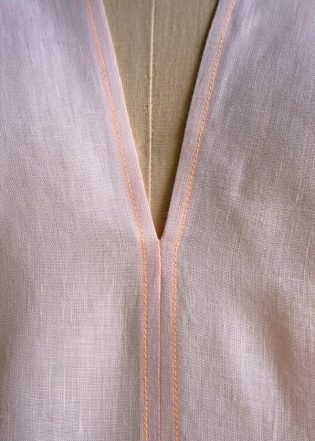 To see more photos and the materials list, check out our new Tunic with Gathered Shoulders in Watercolor Linen story. 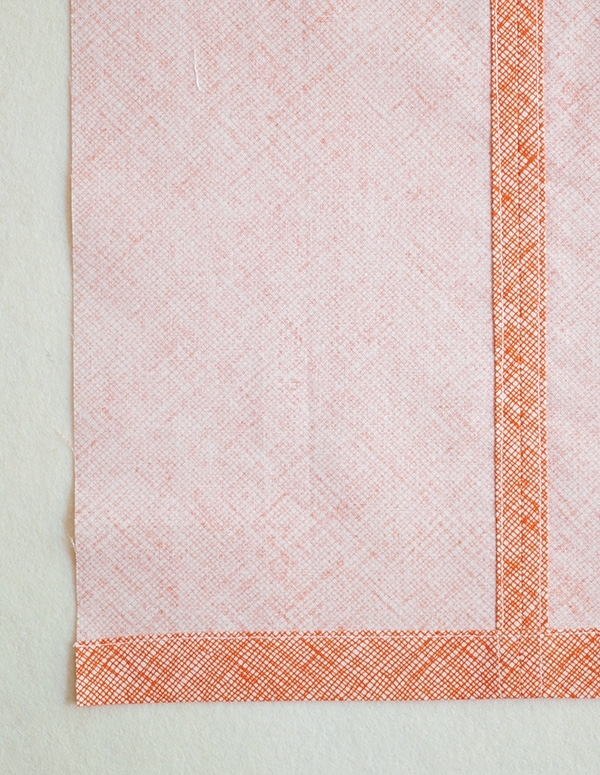 1 (1, 1, 2, 2) yards of Purl Soho’s Handkerchief Linen. We used Pale Pink. 1 spool of Mettler’s Neon Thread. We used the color Sunset. To fit chest sizes 28-31 (32-35, 36-39, 40-43, 44-46) inches in circumference. Prewash, dry and iron your fabric before starting. Cut four 11 x 27 (12 x 28, 13 x 29, 14 x 30, 15 x 31)-inch rectangles. With their wrong sides facing out, stack two of the cut rectangles on top of each other. Pin them together along one long edge for 15 ¾ (16, 16 ¼, 16 ½, 16 ¾) inches. 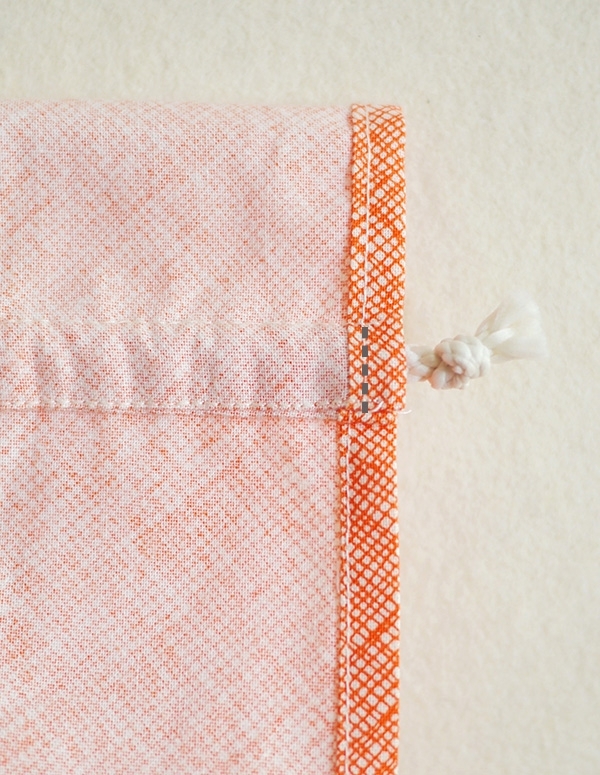 Sew along this pinned edge with a 5/8-inch seam allowance, backstitching at the beginning and end of the seam. This seam is the center of the Front. The unsewn length at the top is the Neckline Edge. Press the seam open. 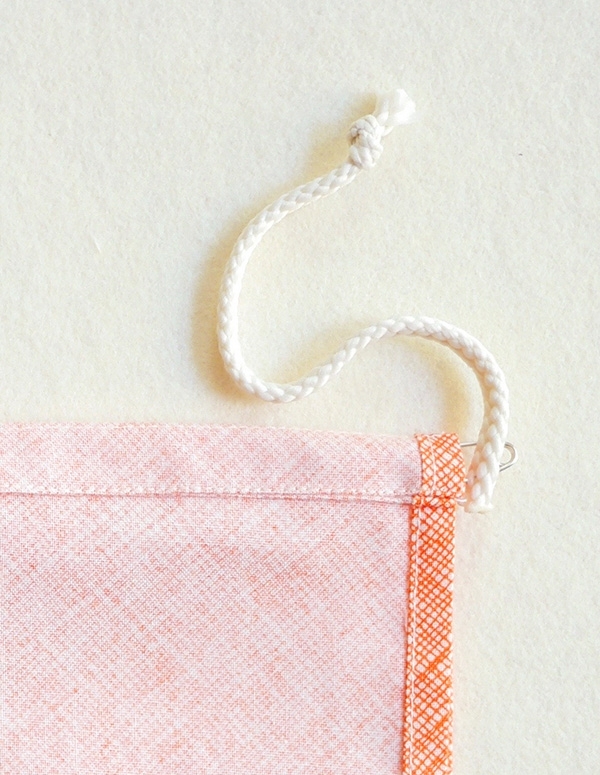 At the Neckline Edge, press the two flaps open following the line of the seam. Fold the raw edges of the seam allowance under so that the raw edges meet the seam. Press flat. Sew the folds down with an edgestitch. With their wrong sides facing out, stack the two remaining rectangles on top of each other. 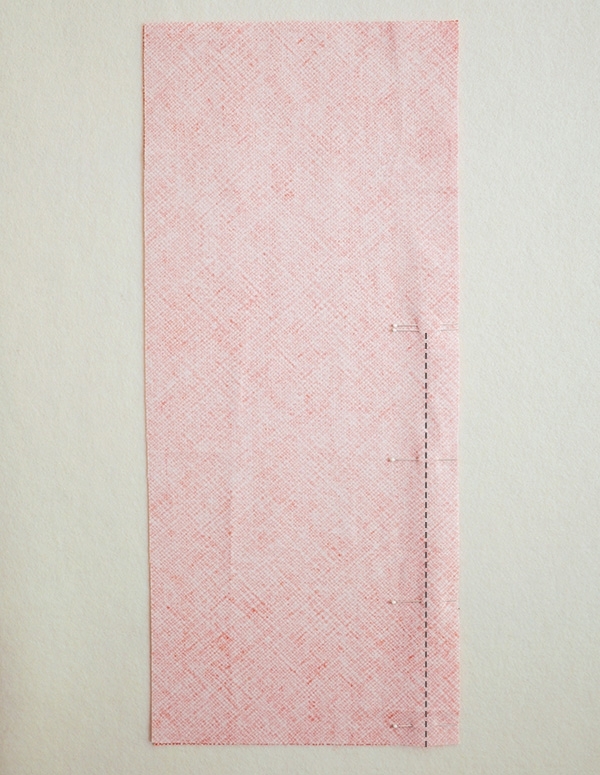 Pin them together along one long edge for 22 ¾ (23, 23 ¼, 23 ½, 23 ¾) inches. 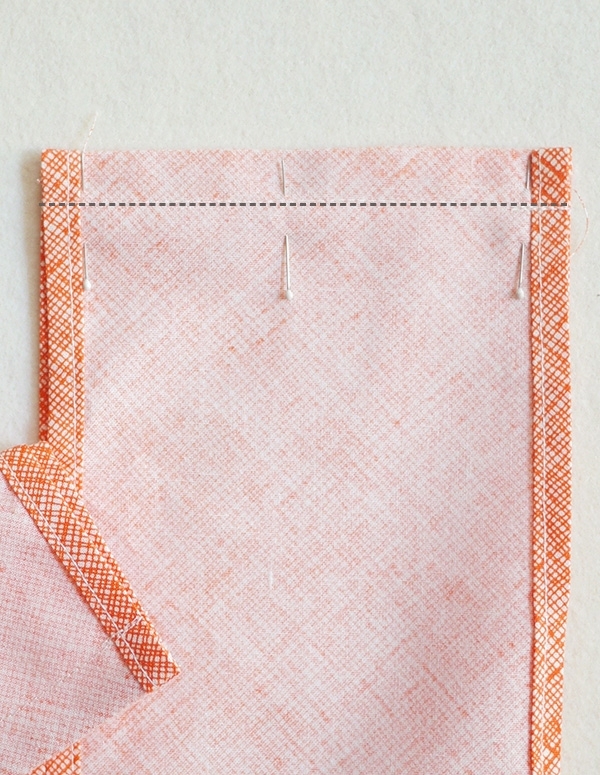 Sew along this pinned edge with a 5/8-inch seam allowance, backstitching at the beginning and end of the seam. This seam is the center of the Back. 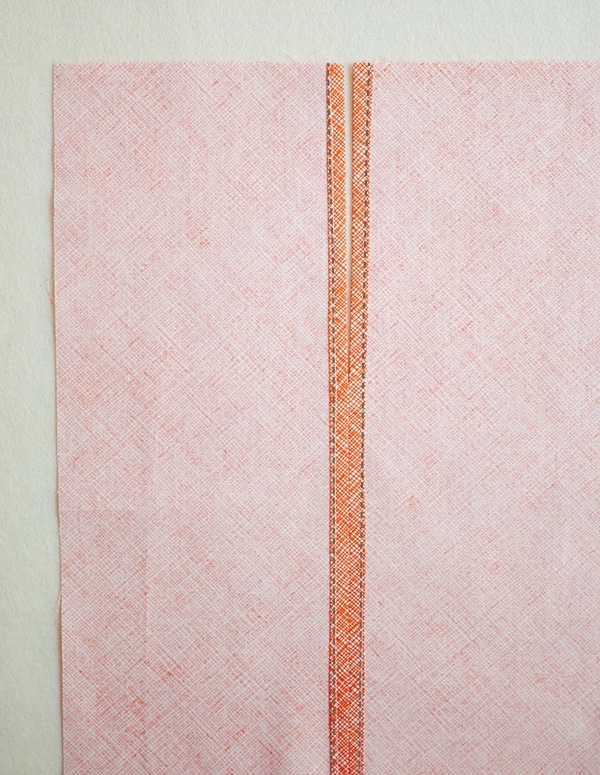 The unsewn length at the top is the Neckline Edge. At the Neckline Edge, press the two flaps open following the line of the seam. 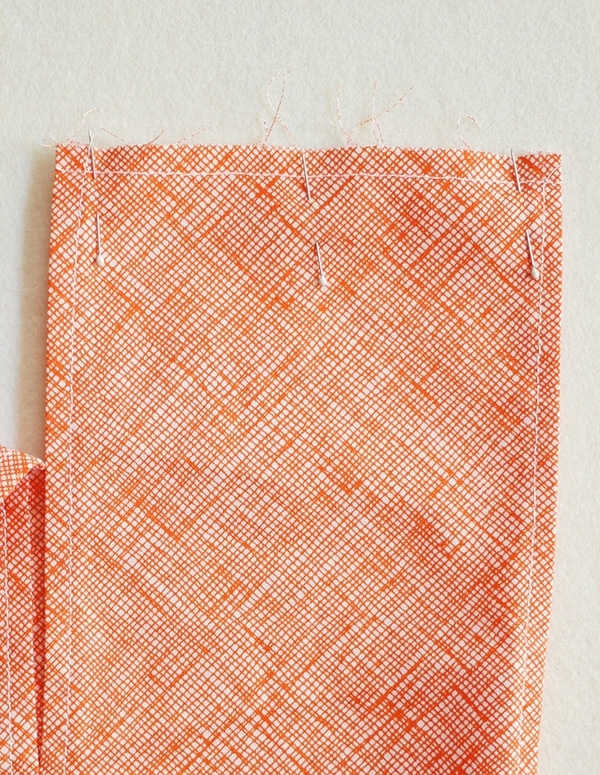 Fold the bottom raw edge of the Front ¼ inch towards the wrong side and press. 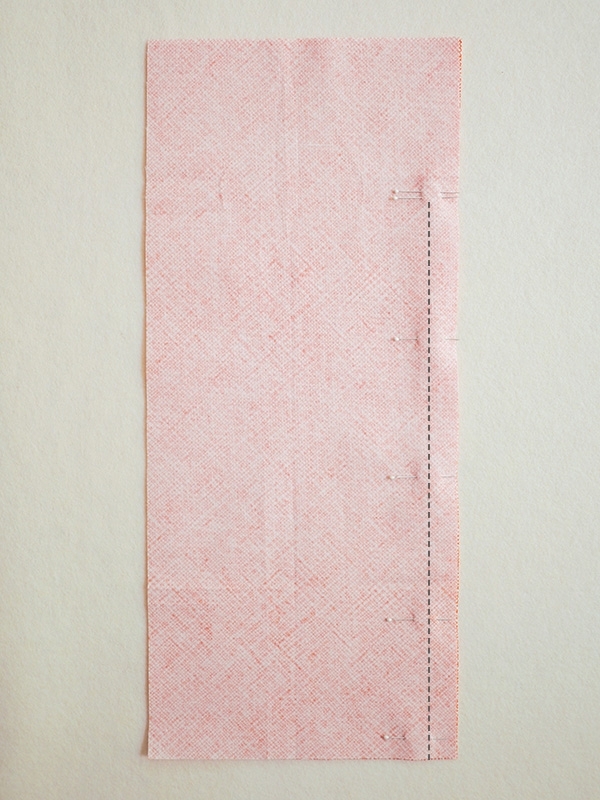 Now, fold the bottom edge ¾ inch towards the wrong side, press and pin. Sew the hem down with an edgestitch. Repeat at the bottom edge of the Back piece. With their wrong sides facing out, stack the Front and Back pieces on top of each other, so that the raw side edges and hemmed bottom edges meet. On one side, measure 5 inches up from the bottom edge and place a double pin. Starting at the double pins, pin 10 ½ (11, 11 ½, 12, 12 ½) inches along the raw edge. Place a double pin at the top of the pinned section. 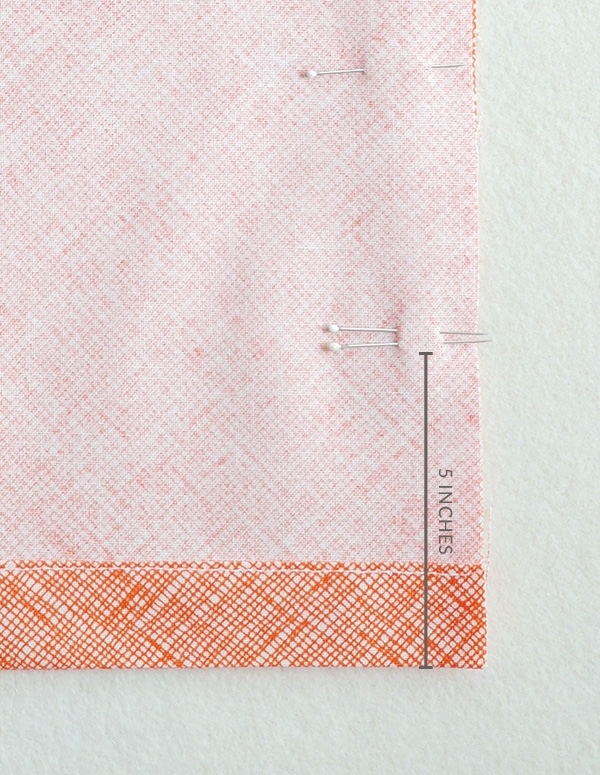 With a 5/8-inch seam allowance, sew between the double pin markings along the pinned edge. Backstitch at the beginning and end of the seam. The unsewn space at the bottom is the Side Slit. The unsewn space at the top is the Armhole Edge. The short raw edges running perpendicular to the Armhole Edge are the Shoulders Edges. Press one side seam open. At the Side Slit and Armhole Edges, press the flaps open, following the line of the seam. With the right side facing out, lay the Tunic flat so that the Shoulder Edges are aligned. Pin the Front Shoulder Edges to the corresponding Back Shoulder Edges. With a ¼-inch seam allowance, sew each Shoulder together along the pinned edges, backstitching at the beginning and end of the seams. Turn the Top so that the wrong side is facing out and press the Shoulder seams flat. 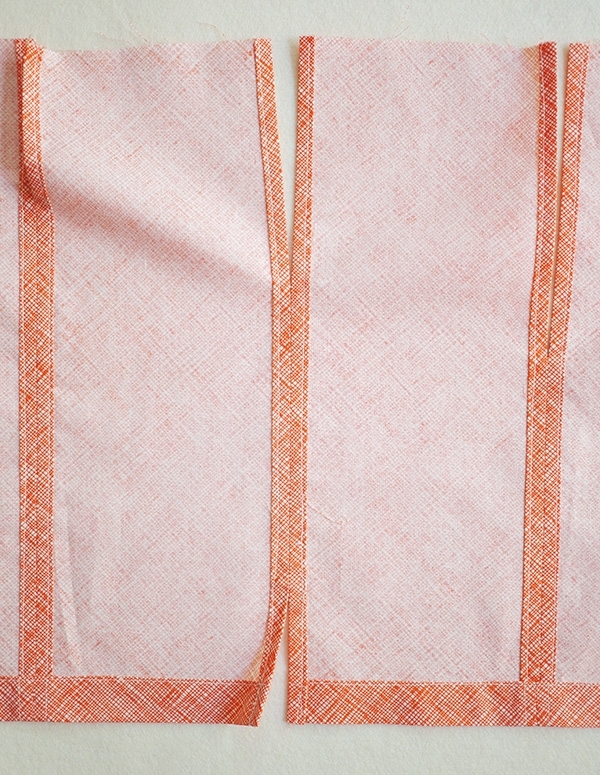 Sew along each Shoulder Edge with a ½-inch seam allowance. 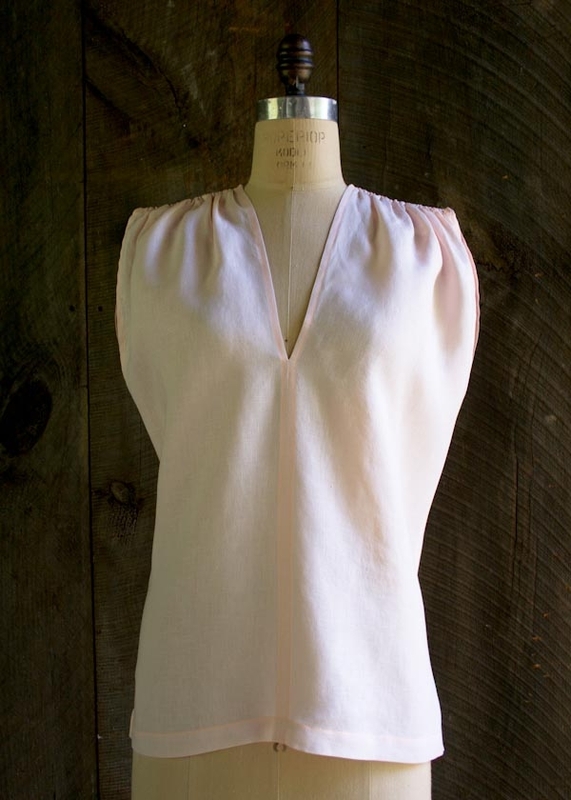 Press each Shoulder seam allowance towards the Front and sew it down with an edgestitch. These are the Shoulder Channels. Cut two 8 (8, 8, 9, 9)-inch pieces from the Lacing. Tie an overhand knot at one end of each piece. At the other end, lightly singe the cut edge with the flame from a lighter or match. This seals the threads and prevents fraying. Attach a safety pin to the singed end of one piece of the Lacing. Push the pinned edge of the Lacing into one Shoulder Channel. Slowly pull the pin through the Channel, stopping right before you pull the knotted end of the Lacing into the Channel. Tack this knotted end of the Lacing to the Shoulder by sewing a short tacking stitch along the seam line of the Armhole Edge. 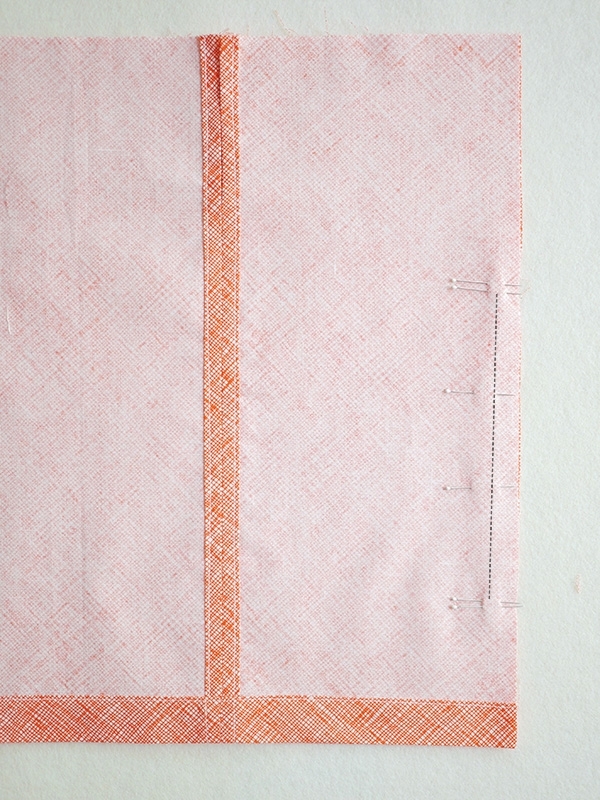 To sew the tacking stitch, first sew forward ½ inch, then backstitch ½ inch, and then sew ½ inch forward again. Continue to pull the Lacing through the Channel until you have pulled the pin out the other side. 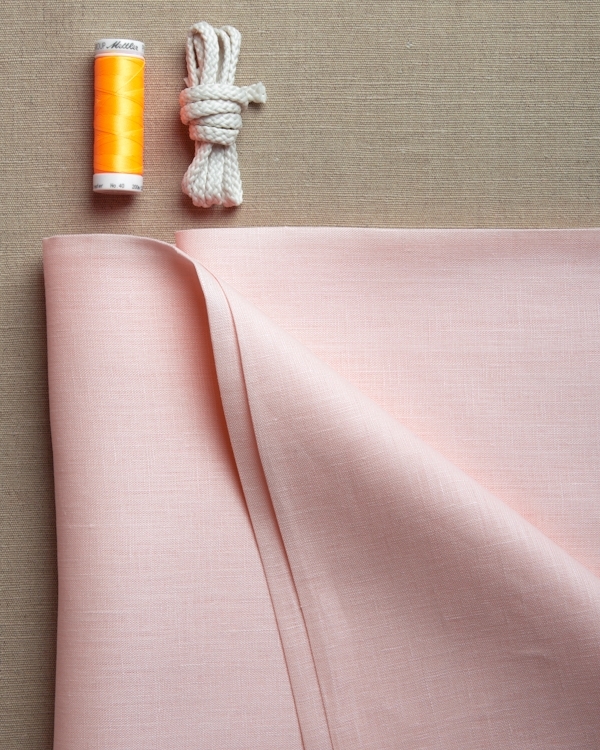 Gather the fabric until the Shoulder measures 4 ½ (5, 5 ¼, 5 ½, 6) inches across. Sew the Lacing to the other side of the Channel with a short tacking stitch, as described above. Trim both ends of the Lacing close to the tacking stitches, and you’re done! Lovely little tunic! Thanks for sharing the process for this – I would love to make something like this! hey i love the design, i was just wondering is there a paper pattern print out for this, as i may need to make adjustments? There are no printed pattern pieces for this garment as it’s made up of four simple rectangles. The dimensions for the rectangles are given in the “Cut” section if the pattern. 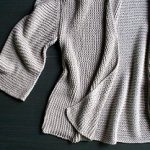 If you are thinking about making adjustments, keep in mind that the short side of the rectangle is the shoulder width (minus 1 1/4 inch for seam allowance), the long side of the rectangle is the length (minus 2 inches for the hems), and the two short sides together make the width of the garment (minus 2 1/2 inches seam allowance). Love this – so simple and easy! But I have the usual request to see it on a real person before I would make it. Thank you! Thank you – it looks beautiful on her! Can you please start posting direct links whenever you link to instagram? It’s near impossible to find a specific picture once some time has passed. Thanks! Thank you for writing in! You’re right, a more direct link would be very helpful! This looks lovely. 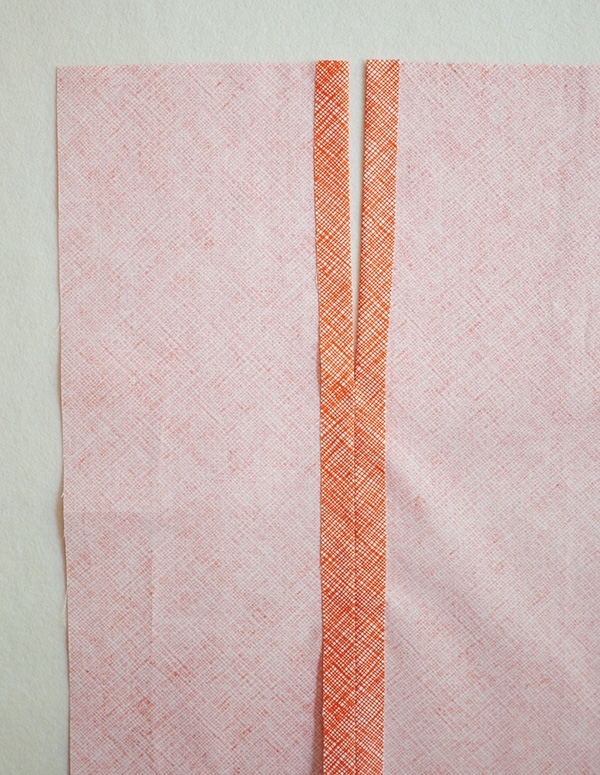 To confirm the above directions, one would need only 1 yard of fabric to complete this tunic? The “1 (1, 1, 2, 2) yards” leaves me a bit unsure. This is a great question. Sorry the pattern leaves this unclear. To make the Tunic in sizes to fit a 28-31, 32-35 or 36-39- inch bust circumference, 1 yard of 56-inch wide fabric will suffice. To make the Tunic to fit a 40-43 or 44-46- inch bust circumference, you will need 2 yards of fabric. Please let me know if you have any other questions as you work on the project. Beautiful! This is inspiring me to sew something for myself this summer. 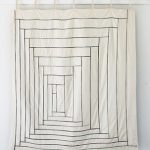 Your step-by-step photos show a different fabric than the pink linen specified, and I like the pattern on that fabric much better than the plain colors of linen. Where can I get some of that pretty cross-hatched fabric? Keep in mind that this is a 44-inch wide fabric (rather than 56-inch, as the linen is) so the required yardage might change. Please let me know if you have any other questions while you work on your project! How do you scale it for 44″ inch fabric? because that is what I have. I have always purchased paper patterns before, so this is new to me. Thanks for writing in! Fortunately, the yardage requirements will be the same for 44″ fabric! By cutting the rectangles on the cross grain – in other words, the short side of each rectangle will run parallel to the selvage of the fabric – you will still be able to cut all the required rectangles from a narrower fabric. Does the neckline have to be so low? I am concerned about cleavage. Lovely pattern. This is a great question, and a super easy fix! In the Piece the Front section of the pattern, when you are pinning along the long edge, simply pin higher than we suggest, keeping in mind that the open space at the top (minus 1 inch for seam allowance) will be the neckline edge. Please let me know if you have any other questions while you sew! Have you seen our photo of the Tunic on Instagram? We paired it with our Gathered Skirt for All Ages, and it looks adorable! How do you think double gauze would work for this tunic? I think this would be lovely in double gauze, and so perfect for summer! Hello! Great pattern! I was wondering if this could be made in 2 pieces? I want to make it out of a print and don’t want to disrupt the print. Do you think it’s possible to make the front all one piece? This is a great question. 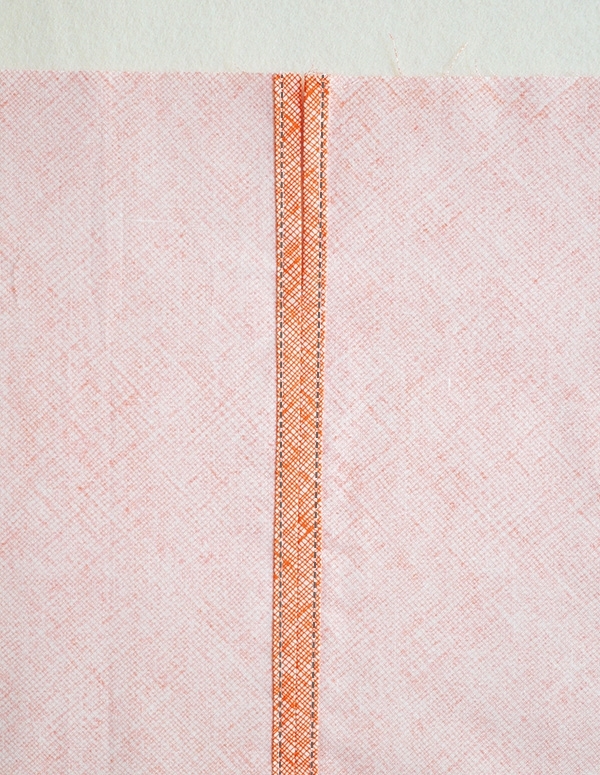 The seams down the front and back of the Tunic are what make the “v” shaped neckline edge. To make the Tunic with two pieces rather than four, you would want to cut out the neckline edge from the front and back pieces and finish with a small hem or bias tape edging. You could finish the side seams, shoulders and hem as they are described in the pattern. Have you seen our Boxy Tee pattern? I think a combination of this Tunic with that neckline might be just what you’re looking for! Please let me know if you need any additional help adapting the pattern! Hope this isn’t too much of a silly question…what is the best way to cut 4 perfect rectangles? Make a paper pattern and use scissors or use a cutting board and cut material like you would for a quilt? This isn’t a silly question at all! The best way to cut large rectangles like this is using a rotary cutter with a non-slip ruler on a self-healing cutting mat. We’ve put together all the tools you need for this in our Rotary Cutting Tool Kit (available right here)! If you’re new to rotary cutting (or even if you’d just like some new tips! ), I also recommend our Rotary Cutting Tutorial. It gives detailed instructions on how to get clean, straight cuts, and stay safe, every time! I am wondering how long the back of tunic is and the length of the V neck when the tunic is finished. I am 5’10” and sometimes I have to adjust the pattern. I will be making the 40-43 size. Thanks! When finished, the Front and Back of the Tunic measure 28 inches from shoulder to hem for the 40-43 size. The Front V is 12 1/2 inches long and the Back V is 5 1/2 inches long. I hope this helps, and please let me know if you need any help making adjustments! Love the simplicity of this! I finished last night and used the 32-35 bust size, tho I measured myself at 36. I still found it to be a bit too roomy up top and the v-neck too low for me. Any suggestions for how I can tailor it now or do I need to start over? Beautiful top! Thank you for sharing it. I am a beginner sewist, having made only simple projects such as your Easy lined tote bag (also loved that pattern), zippered pouches, etc. Would this pattern be appropriate for me to make? 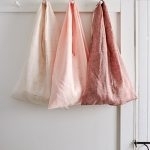 Also, are there any other fabrics that you could recommend using other than linen? 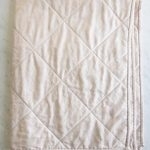 Linen is lovely but it very prone to wrinkling. Thanks for writing in, and for your kind words about the pattern! This top is super simple to put together, especially if you’ve already made the Easy Lined Tote Bag, and tackled zippers! I think it’s a great next project for you, and a great introduction to garments! As for the fabric, any light weight fabric will work well! Have you seen our Wear Anywhere Tunic? It has a very similar construction to this top and we made samples in three beautiful fabrics for three different looks. Any of those fabrics would also be a great fit for this top. You can check out that post for some inspiration! This could be lovely as a dress! There should be plenty of ease in the garment over all to extend past the hips, however you may want to consider adding some width to the Front pieces (either just to one, or both) to extend the overlap of the Front Flaps and add a bit more coverage. I made this for my daughter to play Antigone, with a few small tweaks, especially lengthened to floor length dress. My top tip is to make bar tacks or decorative embroidered motif at the end of each seam, to prevent ripping the stitches or the fabric. Great results – thank you for the free pattern! Can this be lengthened to create a knee length overdress tunic? If so, how do I go about doing it? This is a great question! Yes, this Tunic can easily be lengthened. Just simply add your desired length to the long side of each rectangle before you cut. You can follow all subsequent instructions as given. Alternatively, have you seen our Wear Anywhere Tunic? The design is very similar to this garment, but already has the length you’re looking for. I’m sorry you’re having a hard time with the shoulders on this garment! I’m sure you haven’t made quite the “mess” of it you think you have! 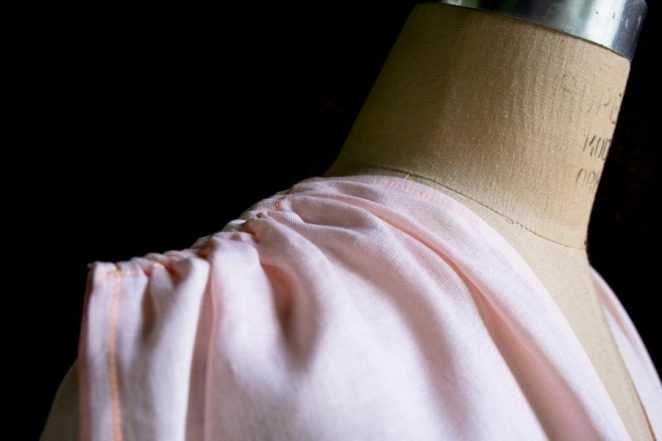 The shoulder seam is sewn as a French seam, meaning that it is sewn twice in order to encase the raw edges for the seam allowance of the first seam inside the seam allowance of the second seam. 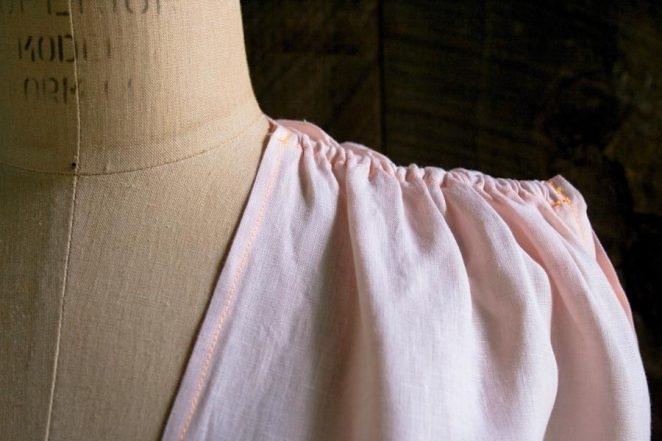 The first two steps of sewing the shoulder seams are to create this French Seam. Next, you make the channel by folding the seam allowance towards the front of the garment and sewing it down with an edgestitch (that runs along the top fold of the seam allowance of the shoulder seam). I hope I have helped clarify, rather than making it more confusing! Please let me know if you continue to have problems and I am happy to help! Thanks for writing in! The channel is sewn from the wrong side. What I think you are seeing is that we used a thread the is an accent color rather than a color that disappears. As such, the color of the stitching show prominently on the right side. hi I love this pattern but i cant seem to open the link for free template. We are so glad that you love the pattern! This is not a traditional pattern with a template, rather there is a list of cuts with measurements. You will be cutting four rectangles out of the linen that are 11 x 27 (12 x 28, 13 x 29, 14 x 30, 15 x 31)-inches depending on the size that you select. I’m also confused about the shoulders. Is the first sewing pass done with the right sides facing out? Then turned for the 2nd pass? Your pictures seem to indicate that. Thanks. Thanks for writing in! You are correct. The first sewing pass for the shoulders is with the right sides facing out and then turned so that the second pass is on the wrong side. This creates a neat seam with not exposed edges as well as creating the channel that you will use to create the gathered shoulder detail. I was wondering how it would look with just cotton fabric, like calicos or muslin? Hi Teresa! That sounds like a great idea! 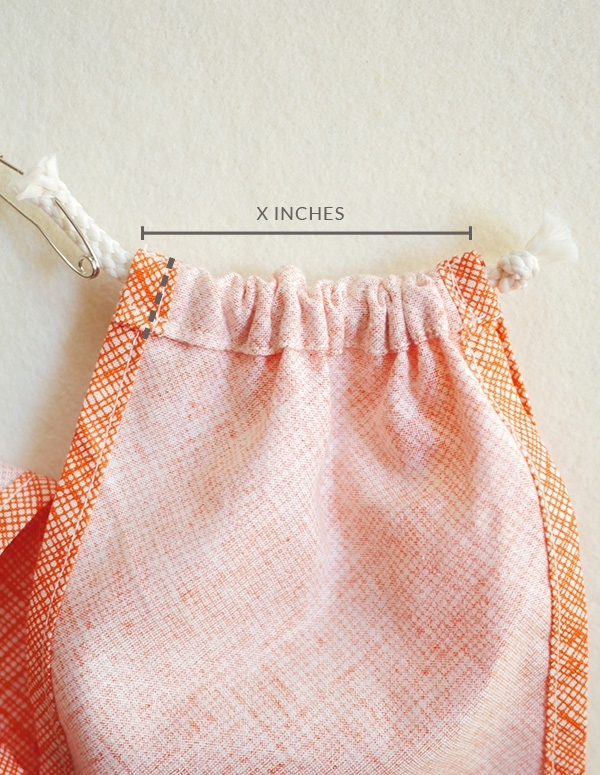 This easy pattern works well with many different types of fabric. We say, go for it! Thank you for a lovely pattern and such clear instructions. If I made the tunic without gathering the shoulders, would the fabric drape over the tops of my arms like a short sleeved top? I prefer short sleeves to be elbow-length to hide my upper arms. Thanks for the question! This is a hard one to say for sure. 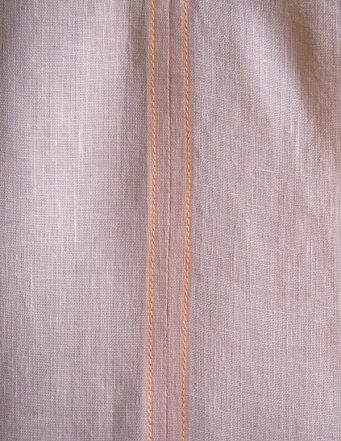 Linen can be quite structural and I am not sure if it would drape or point out to the sides. If the fabric you are using has a fair amount of drape to it, it will fall down you arms but ever so slightly, reaching maybe down to your armpit. If you are interested in a top with sleeves our Boxy Tee and Sewn Raglan Shirt may be good alternatives to this sleeveless tunic. Thanks for writing in! I love the idea! You can certainly lengthen this tunic into a dress. Given that there is no shaping to the body, you may want to belt the resulting dress in order to give it some shape. 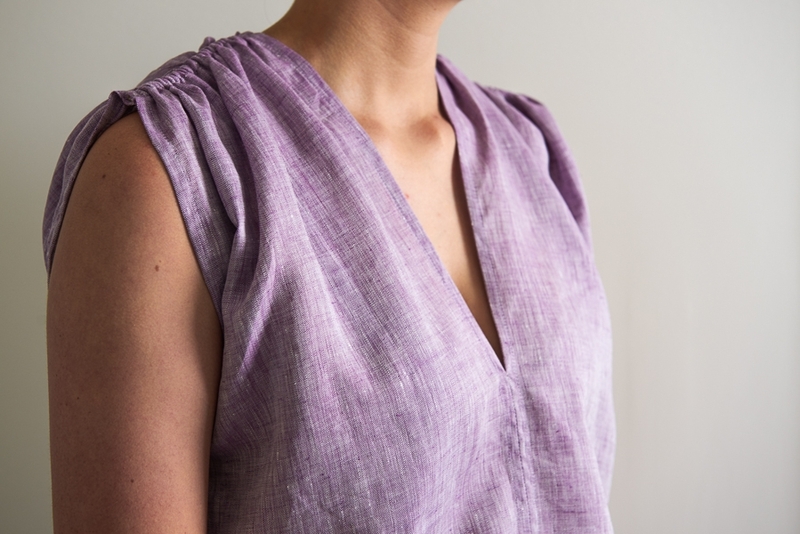 You may also want to check out our Wear Anywhere Tunic, which is already a dress length and could certainly be made with the Handkerchief Linen that we used for this Tunic. If you try it out, please do let us know! I’m getting ready to make this tunic in Ecru handkerchief linen. 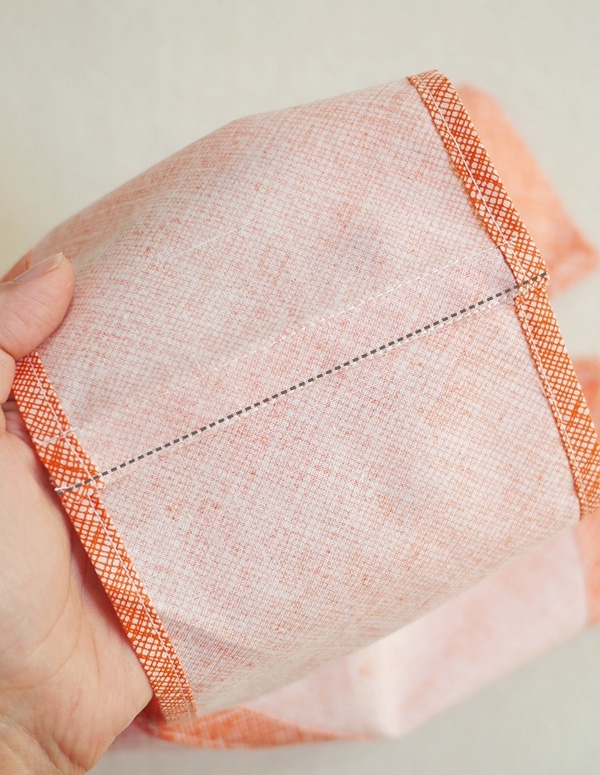 In your mitered corner napkin tutorial you emphasis the need to ensure your fabric is square before cutting out the squares. Is this also important when cutting out rectangles for the tunic? I’m fairly new to sewing and a little stressed about cutting my beautiful fabric incorrectly. Also, should each rectangle be cut out separately or is it okay to fold the fabric such that you cut them all out at once? Great question! You will want to be sure to true up the fabric to cut as close as possible to straight lines that match the wrap and weft of the fabric. 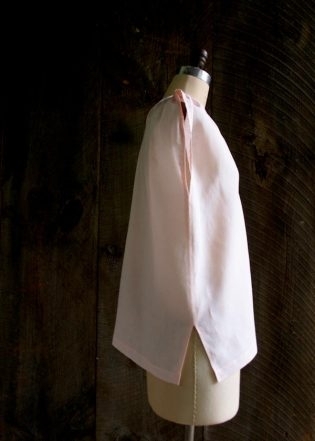 This creates a better drape of the fabric and the final garment will hang better. 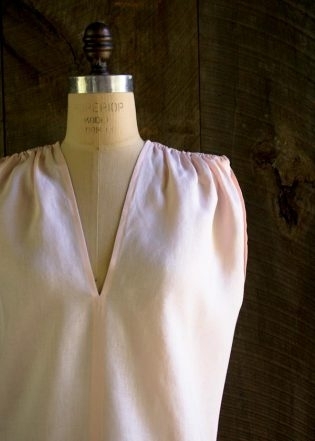 This little V-neck blouse with gathered shoulders is just the cat’s meow! Too cute. The thin elastic would not lay properly,it might curl up on the edges of the shoulder, you need something a little heavier to hold the gathers. There doesn’t seem to be a link for the pattern here? For this pattern there is not a link, there are no actual pattern pieces. You will be cutting two rectangles from the fabric, the size depends on your measurements. If you scroll down it shows you in the pattern. You could make the tabs longer, pull the tabs on the shoulder tighter and let them show which is what a commercial designer did with a similar top I purchased. They also put the tape along the bottom and had those ties showing as well. It gives the top additional interest. Maybe in that neon color? And can be done in many lengths, which could be more flattering for different shapes. You could also create this gathered loosely along the sides for a different look. Very creative, simple design. I love the look of this tunic and will be making one for my mom. Could I do the shoulders in a traditional gather? The way it’s done here appears to be too thick to wear with a handbag for example. Thanks for reaching out! Yes, you could certainly substitute a traditional gather, or even pleats, in place of the cording we used if you prefer a flatter shoulder. If you give it a try, please let us know how it turns out! 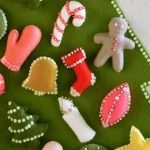 Very excited to try to make this! Shoulders are confusing me as well. Once you’ve done the tacking, is the channel just open at the edge once you’ve clipped the cord? Or you clip then sew it closed? Thank you! Thanks for reaching out! You will be sewing the tacking stitches along the seam line which is about a half inch away from the outer edge of the shoulder and then trimming the cord close to those stitches. Since the outer edges of the shoulder have already been hemmed and finished, there is no need to sew the end of the channel shut – the trimmed edges of the cord will hide nicely inside of the end of the channel.